In the last 200 years, life expectancy has doubled in every country across the world. Even the poorest countries in the world have life expectancies at least 10 years higher than the richest countries had two centuries ago. Since the 1950s, there has been rapid convergence in life expectancies for the richest and poorest countries and now over 80% of the world’s population is expected to live over 65 years old. Today, living standards are dramatically higher than ever before (see here and here) and this has led to a rapid improvement in life expectancies across the world. As can be seen in the chart below, in 1800 the richest countries in the world had life expectancies below 40 years and this has doubled to over 80 years today. While increases in life expectancies in the poorest countries have been smaller in absolute terms they have still doubled from around 25 years in 1800 to over 50 years today. In the last half a century there has been a significant convergence in life expectancies between the richest and poorest countries. 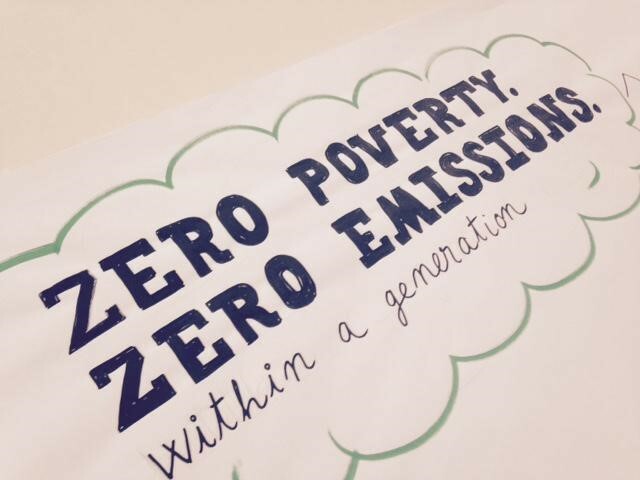 Much of this advancement has been through improving the quality of life in poorer countries in the last 65 years. In 1950, life expectancies were twice as high in the richest countries in the world compared to the poorest countries. However, today the bottom 40% of the world’s population is expected to live around three-quarters as long as to top 10%. Even in today’s poorest countries, life expectancy is ten years higher than half of the world’s population in 1950 and the richest countries in the world in 1800. This year Australia will provide less than 0.25% of GNI in aid, which is around one third of its international commitment to reach 0.7% of GNI by 2015. Successive Australian Governments have cut a total of almost $20 billion from the aid budget in recent years, after abandoning a domestic commitment to give 0.5% of GNI in aid by 2015. As a result of these aid cuts, Australia provides around 1/5 as much aid as the United Kingdom (UK) despite Australia being in a much stronger economic position. 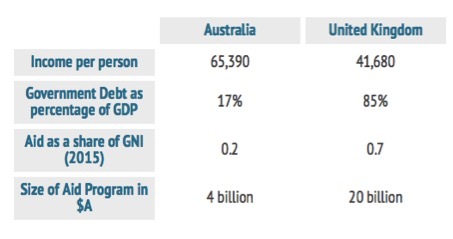 Australia has fallen spectacularly short of its international commitment to provide 0.7% of GNI in aid by 2015. This would have equated to providing less than 3% of the Government’s budget in aid, however Australia only provides around 1% (see here). Successive Australian Governments have cut the aid budget six times in three years, which was justified as necessary to help with balancing the government’s books. This had led to an abandoning of a bipartisan agreement to increase the aid budget to reach 0.5% of GNI by 2015. Therefore while global aid flows are increasing, Australian aid is shrinking (see here). 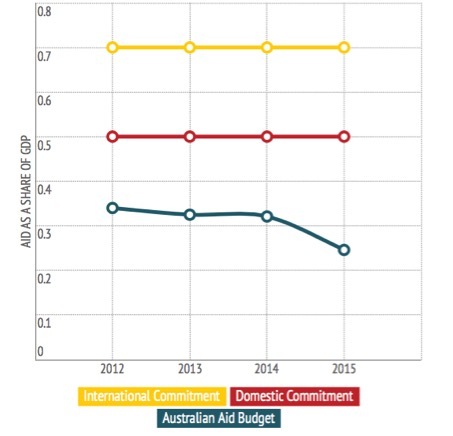 The chart below shows how this year, Australia’s aid budget will shrink to around one-third of its international commitment and less than half of its domestic commitment. Australia’s lack of aid generosity compares unfavourably to many other aid donors, especially the United Kingdom. In the same week as the UK parliament passed a law to provide 0.7% of GNI in aid, the Australian Prime Minister described Australia’s vicious aid cuts as ‘modest’. This is despite Australia being in a significantly better economic position than the UK, as can be seen in the table below. 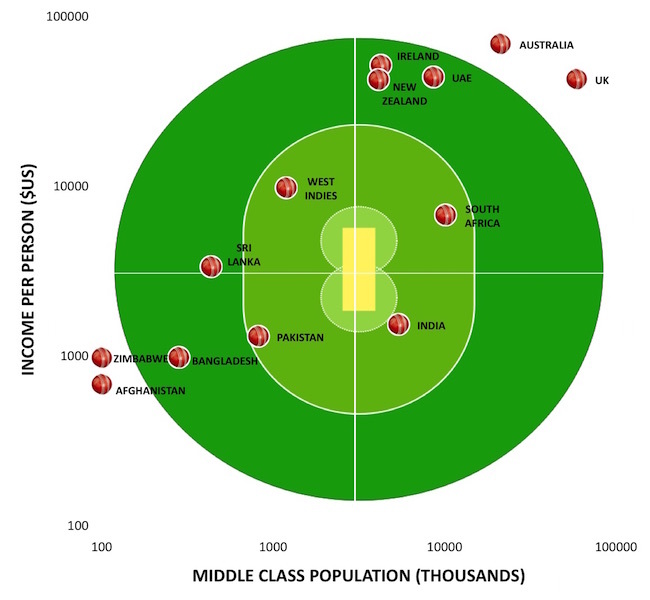 Australia has an income per person more than 50% higher than the UK and Australia has only around 20% the level of government debt, yet it provides only 1/5 the level of aid. While the UK Prime Minister, David Cameron, famously said the UK would not ‘balance the books on the backs of the poor’, it appears Australia is trying to do just that. The World Bank along with the International Institute for Applied Systems Analysis operate an online portal where you can find your place in the Global Population Pyramid. For example, if you are Australian and today was your 30th Birthday, this interactive website would show you that while the majority of the world’s population are younger than you, 60% of Australians are older than you. To find out more check out the following video or the website for yourself. This initiative highlights that the shape of a country’s population pyramid tends to correspond with their overall level of development. Typically high income countries, like Japan or Australia, have an aging population where the average person is well over 30. While most middle income countries, like China and India, are in the process of benefiting from a demographic dividend whereby the bulk of the population are of working age. Whereas in the average low income country, such as Uganda or Mozambique, the vast majority of people are below the age of 30. 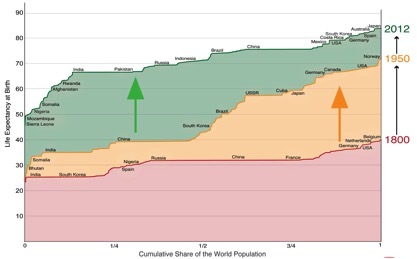 You can use the online portal to see how your place in the global population pyramid would vary if you had been born in a different country or time period. Can Poor Countries Afford to Eliminate Extreme Poverty on their own? Most poor countries do not have enough money in their economies to bring everyone out of extreme poverty through redistributing taxes alone. 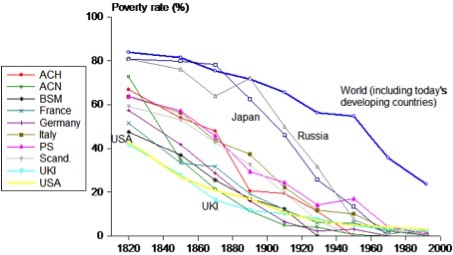 Only once countries tend to have reached upper middle-income country status does it become theoretically feasible for them to be able to eliminate extreme poverty on their own. Most low and lower middle-income countries can’t afford to eliminate extreme poverty by redistributing taxes on their non-poor population to those in extreme poverty. Former World Bank economist, Martin Ravallion, illustrates this. He defines being non-poor by a developed country standard, living above the US poverty line of $13 a day (or an annual income of around US$5,000). 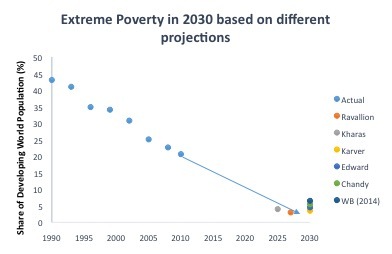 Ravallion calculates what the additional (marginal) tax rate would need to be in a developing country on the non-poor population to be able to raise enough tax revenue to be able to theoretically bring everyone out of extreme poverty (see chart below). 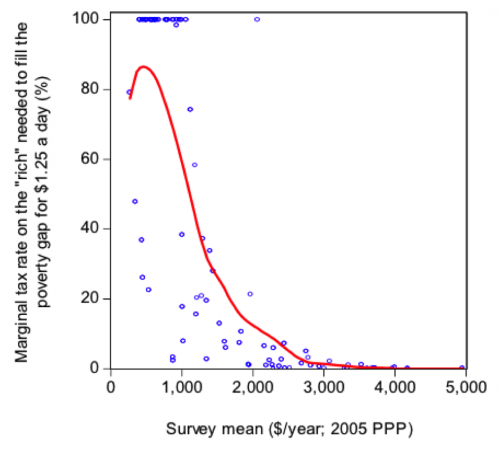 For example a country with an average income of around US$1000 a year would need to raise the tax rate on their non-poor (or ‘rich’) population by 60 percentage points to generate enough tax revenue to give to the poor to lift them out of extreme poverty. This is quite unrealistic politically. As incomes in poor countries rise, through economic growth and other measures, the additional tax rate required to raise enough revenue to eliminate extreme poverty becomes more politically feasible. 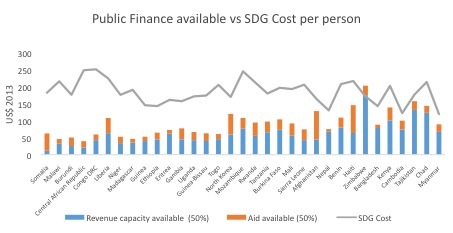 However in the meantime, external funding sources such as aid, are needed in most low and lower middle-income countries to be able to eliminate extreme poverty. Relying on redistributing taxes alone would push the non-poor back into poverty (by developed country standards). This seems to suggest that the rush by some aid donors to abandon providing aid to some middle-income countries is premature. 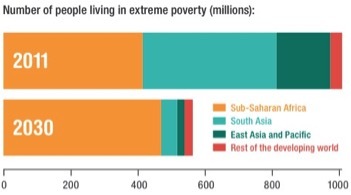 Assistance is still needed to end extreme poverty in many of these countries. How Committed are Rich Countries to Development in Poor Countries? Recently, this year’s Commitment to Development Index was released, which ranks rich countries based upon a number of factors, such as Aid, Trade and Environmental policies. 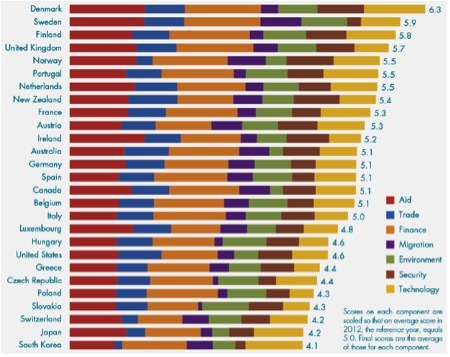 Northern European Countries, such as Denmark, Sweden and Norway continue to be on the top of the list. While South Korea, Japan and Switzerland are at the bottom. Interestingly, New Zealand substantially outperforms Australia, while the United States and Germany are on par with Greece and Spain respectively. The index shows that all rich countries could be doing much more to contribute to international development. Each year the Centre for Global Development, an international development think tank, ranks rich countries based upon how their policies enable or inhibit development in poor countries. The seven factors included in the index relate to Aid, Trade, Finance, Migration, Environment, Security and Technology. The latest rankings released in early January are shown in the Figure below. The index measures rich countries commitment to international development beyond comparing aid levels alone, which dramatically alters the rankings of some countries. Luxembourg falls from 1st place based upon aid as a share of GNI to 18th place based upon the more comprehensive index. While Portugal moves much higher up the list to 6th place compared to 12th place when comparing just aid. 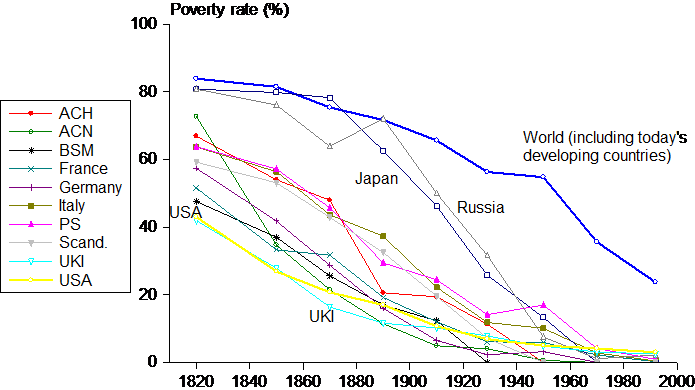 Importantly, this index shows that rich countries could be doing much more to contribute to international development. Every country performed poorly in at least one of the seven factors included in the index.